Thanks to your support, Habitat is transforming the lives of more than 30 Adams County families, and counting! We are grateful for monetary donations; as well as donated/discounted construction materials, appliances, and services; or donations of land and lots for future building. Please contact Adams County Habitat for Humanity with your gift today! 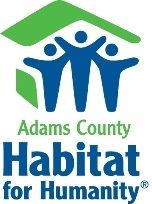 Adams County Habitat for Humanity is a tax-exempt 501(C)(3) nonprofit organization. Your gift is tax-deductible as allowed by law.